Store at 52 Maria Street, which Sam Shulman says he bought for his wife, Fanny Shulman, who is under arrest for alleged manslaughter in connection with the death of Richard Atkinson, stated to be the victim of alcoholic poisoning. Star, July 28, 1926. 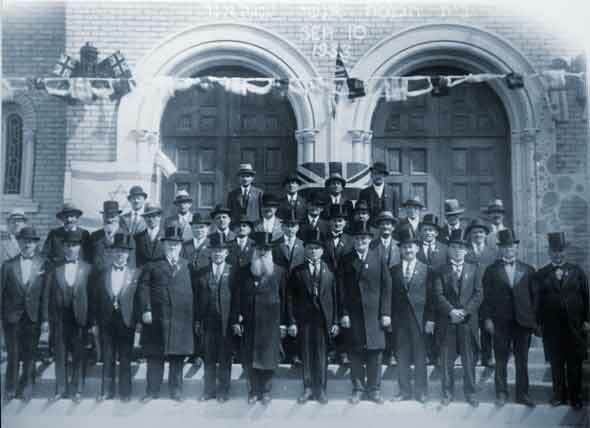 NEW SYNAGOGUE DEDICATED — Hebrew Men of England Synagogue, Spadina Avenue and Baldwin Street, dedicated by Rabbi Sachs. President is D. Himel; rabbi is M. Levi, and the congregation numbers 300. The buildings costs $50,000. Telegram, September 1933. Photograph of the opening of the Hebrew Men of England Synagogue, September 1933. Courtesy A. Bornstein. 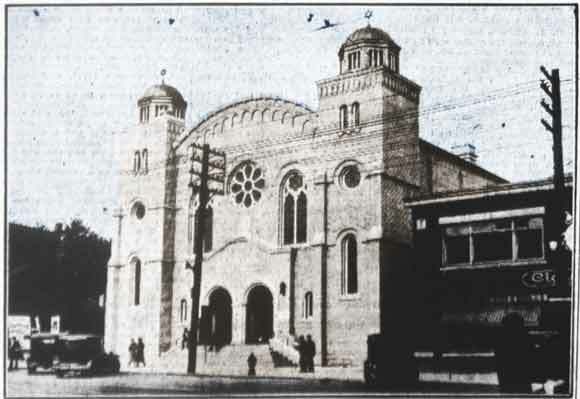 THE SHOMRAI SHABBAS CONGREGATION, at 225 Brunswick Avenue, which replaces the synagogue at 111 Chestnut Street and which has been dedicated in time for the coming New Year holidays, starting next Wednesday. Rabbi Sachs officiated at the parade of scrolls which marked the opening. Telegram, September 1933. 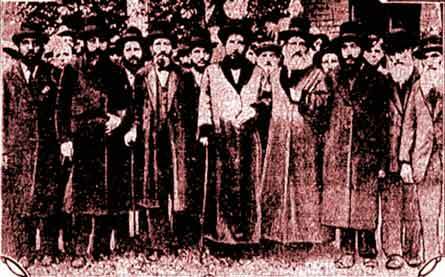 Group of Toronto rabbis, late 1920s. Story to follow . . .
Toronto Jews Parade City Streets. A number estimated at 10,000 paraded through downtown Toronto streets last night, en route to Massey Hall, where a protest meeting was held respecting killing of Jews by Arabs in Palestine. 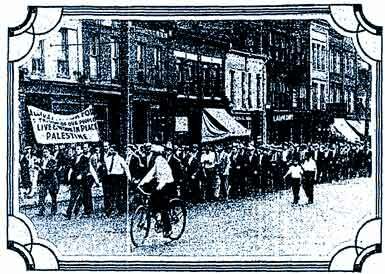 A portion of the parade is shown in the picture. 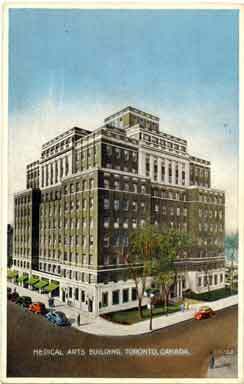 Globe, September 1929. 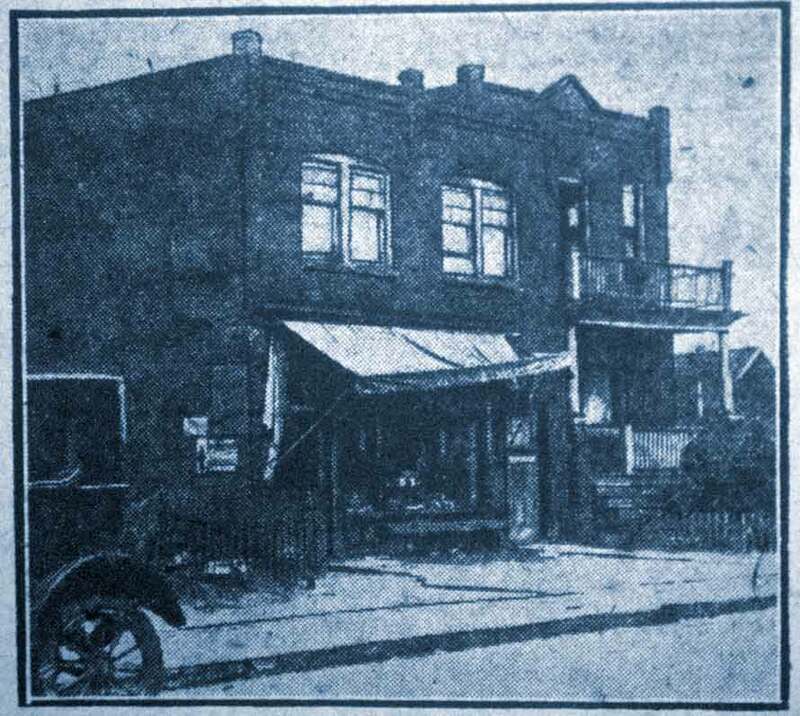 ANNA GARLOCK MURDER, MARCH 1914: Place on Adelaide where Anna Garlock was Murdered. 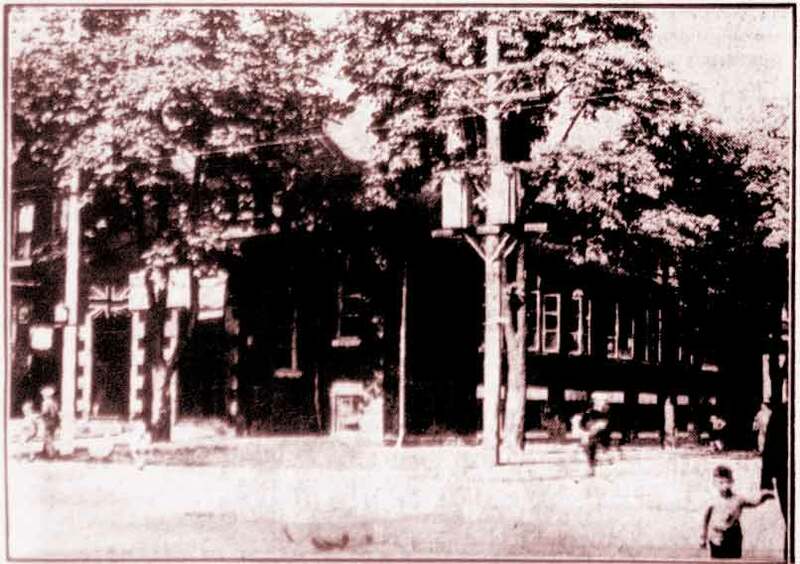 Isaac Estrean, a coatmaker, 363 Adelaide street west, infuriated at the refusal of his former sweetheart to accept his attentions, whipped a gun from his pocket and firing four shots into the body of the young woman, killed her instantly. 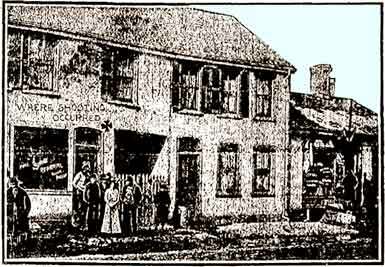 Pursued by her brother and two companions, he turned the gun on himself when captured and attempted to commit suicide. The bullet entered the abdomen and may prove fatal. Estrean is now lying in the General Hospital under constant police supervision. 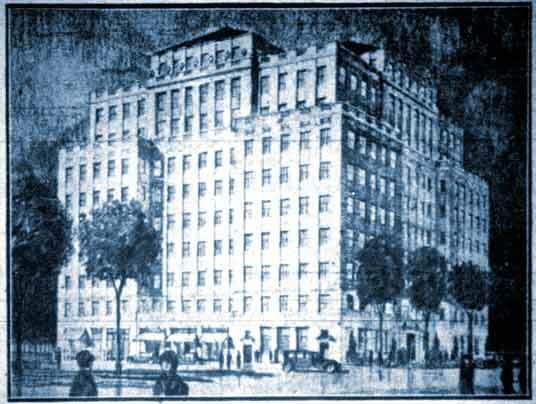 The murder was committed at 410 Adelaide street west. THE MURDERED GIRL (left) : Anna Garlock, the Jewish girl who was shot and instantly killed by her former lover, Isaac Estrean, at 410 Adelaide street west yesterday afternoon. 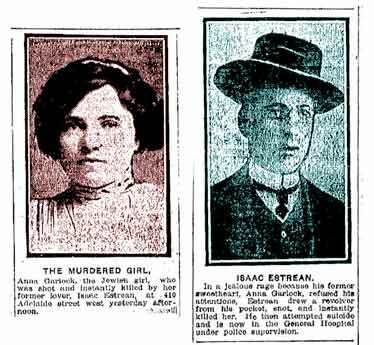 ISAAC ESTREAN (right) : In a jealous rage because his former sweetheart, Anna Garlock, refused his attentions, Estrean drew a revolver from his pocket, shot, and instantly killer her. He then attempted suicide and is now in the General Hospital under police supervision.